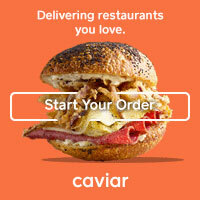 The Super Bowl is only days away and game day is a big deal for those of us that like to cook and entertain! I'm off the hook again this year as our good friends Tara and Nick are hosting their annual Super Bowl bash and all we have to bring is a drink... which I am more than okay with! For those of you that are hosting a Super Bowl party, first, God bless you. 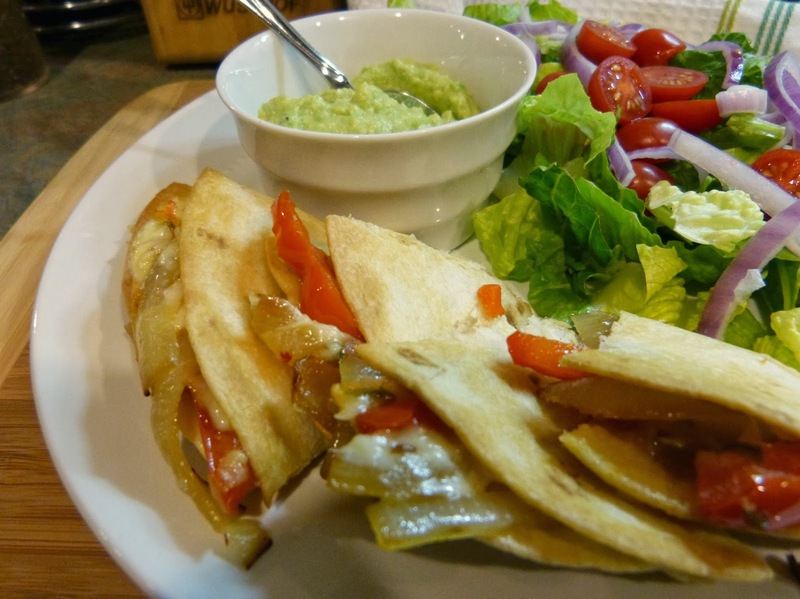 Second, here's a great easy for easy cheesy quesadillas to serve at your gathering! 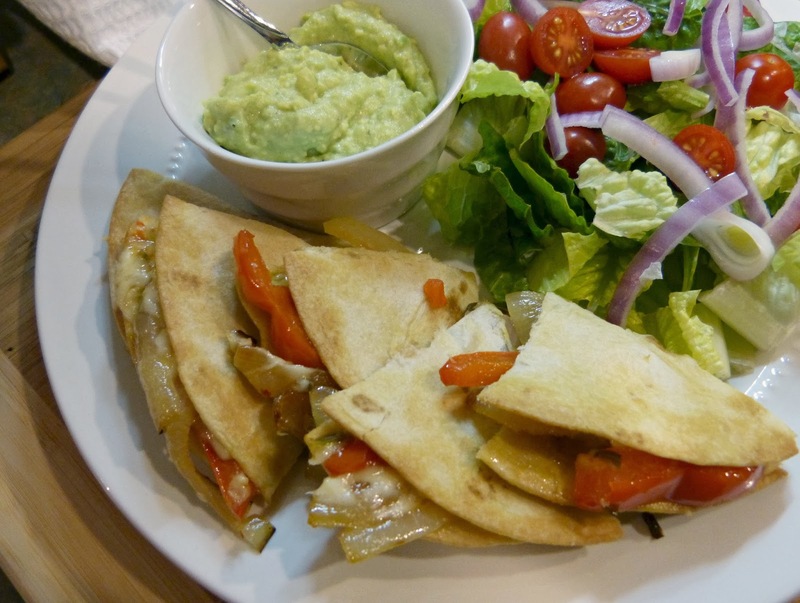 These quesadillas are baked in the oven, so they are super easy to make because you can bake several at one time. Serve them up with a selection of sour cream, salsa, and guacamole (my pick) for dipping and you are all set! The three pepper combination is really delicious: some heat from the jalapenos and pepper jack cheese and a little sweetness from the sauteed red bell peppers. This is also a meatless snack, so it's perfect for vegetarian and carnivorous guests alike. Looking for some more Super Bowl recipe inspiration? Check out my Party Appetizers board on Pinterest or this post with a great Super Bowl recipe round up! Heat 1/2 Tbs. olive oil in a skillet over medium heat. Add salt and onions and saute for 3-5 minutes until they begin to soften. Add jalapenos and bell peppers to the skillet and cook for another 10 minutes, until all vegetables are soft and slightly browned. Brush one side of 3 of the tortillas lightly with olive oil and arranged oil side down on a baking sheet. Sprinkle 1 oz. of cheese on top of each tortilla and then spread the onion and pepper mixture evenly over the top of each cheese-covered tortilla. Sprinkle the remaining 3 oz. of cheese evenly over the top of each tortilla. Brush one side of the remaining 3 tortillas with olive oil and place oil side up on top of the three pepper and cheese-topped tortillas. Bake for 12 minutes. Gently flip each quesadilla and bake for an additional 5 minutes. Serve warm with dip of your choice.